How to Cite This Chapter: Iorio A, Crowther M, Windyga J. Acquired Hemophilia A. McMaster Textbook of Internal Medicine. Kraków: Medycyna Praktyczna. 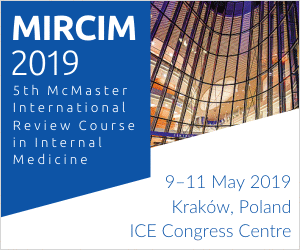 https://empendium.com/mcmtextbook/chapter/B31.II.15.20.3 Accessed April 23, 2019. Acquired hemophilia A (AHA) is an autoimmune disease caused by antibodies to factor VIII (factor VIII inhibitors). AHA is very rare and affects both men and women. Etiology is unknown in 50% of patients. AHA may develop in mothers within 6 months of delivery as well as in patients with autoimmune diseases, malignancy, allergic diseases, or drug-induced reactions. AHA manifests as acute severe coagulopathy with cutaneous, mucous membrane (gastrointestinal, urinary, genital), dental site, and surgical site bleeding. Less common features include retroperitoneal hematoma, intracranial bleeding, and bleeding into skeletal muscles. Very rarely, patients may have spontaneous bleeding into the joints (a manifestation typical for hemophilia A). In ~30% of patients (and more frequently for postpartum cases), AHA resolves spontaneously within one year. Relapses occur in ~20% of patients in whom remission has been achieved with prior immunosuppressive treatment. 1. 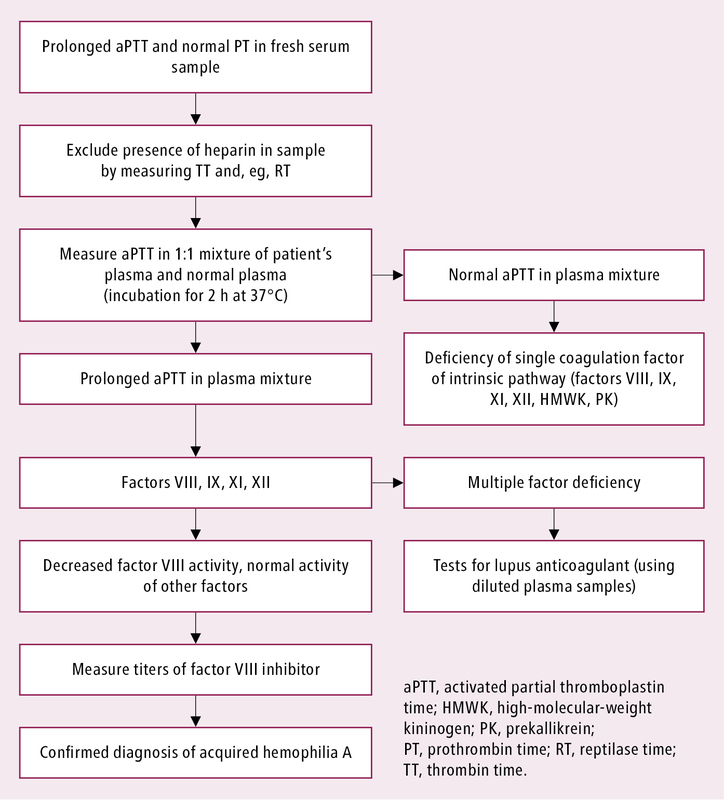 Screening tests: The activated partial thromboplastin time (aPTT) is usually prolonged (on average 2-3 times, although the degree of prolongation is dependent on reagent sensitivity and inhibitor titers). Prothrombin time (PT), thrombin time (TT), platelet counts, and serum fibrinogen levels are normal (unless consumption or dilutional coagulopathy has developed, or the inhibitor antibody affects multiple coagulation factors). 2. Studies confirming the diagnosis: Absence of aPTT normalization in a 1:1 mixture of the patient’s plasma and normal plasma (the aPTT mixing test, which requires prolonged incubation to detect acquired inhibitors), decreased factor VIII activity (usually 2-10 U/dL), a positive factor VIII inhibitor test result. AHA is diagnosed on the basis of typical clinical manifestations as well as results of the screening tests and studies confirming the diagnosis (Figure 1). A combination of screening test results consistent with AHA may also be seen in hemophilia A, inherited deficiency of factor XI or factor XII, or in patients with lupus anticoagulant (in which case thrombosis may be present). Various acquired coagulopathies can present with similar signs and symptoms (eg, well-compensated chronic disseminated intravascular coagulation). Management of a patient with AHA: Figure 2. 1. Short-term treatment goals include treatment of bleeding. 2. The long-term treatment goal is eradication of factor VIII inhibitors. 1. Promptly diagnose and treat underlying conditions, if any. 2. Avoid invasive procedures, intramuscular injections, administration of acetylsalicylic acid or nonsteroidal anti-inflammatory drugs. Be conservative in performing fasciotomy for compartmental syndromes provoked by muscular hematomas. 1) The first-line treatment is recombinant activated factor VII concentrate (rFVIIa) ≥90 microg/kg IV every 2 to 24 hours, activated prothrombin complex concentrate (aPCC) 50 to 100 U/kg IV every 8 to 12 hours (up to a maximum dose of 200 U/kg per day), or recombinant porcine factor VIII 50 to 200 U/kg per day. 2) Desmopressin may be effective in cases of AHA with low titers of factor VIII inhibitors and minor bleeding. a) Plasmapheresis or extracorporeal immunoadsorption followed by the administration of factor VIII (this type of treatment has a low efficacy). b) Sequential treatment with both first-line agents, for instance, an alternate administration of rFVIIa in a dose ≥90 microg/kg and aPCC in a dose of 50 to 100 U/kg every 6 hours. 1) The first-line treatment is oral prednisone 1 to 2 mg/kg/d; it may be combined with oral cyclophosphamide 1.5 to 2 mg/kg/d. The maximum duration of treatment is 4 to 6 weeks before a second-line treatment is introduced. Remission is achieved in ~70% of patients, for whom very slow tapering of prednisone is recommended. 2) Second-line treatments include rituximab, azathioprine, vincristine, mycophenolate mofetil, cyclosporine (INN ciclosporin), intravenous immunoglobulin, cladribine. 3) In patients not responding to immunosuppressive treatment, continue the follow-up and treat bleeding when present. 4) In patients with relapse use the immunosuppressive treatment that achieved the first remission. Figure 1. 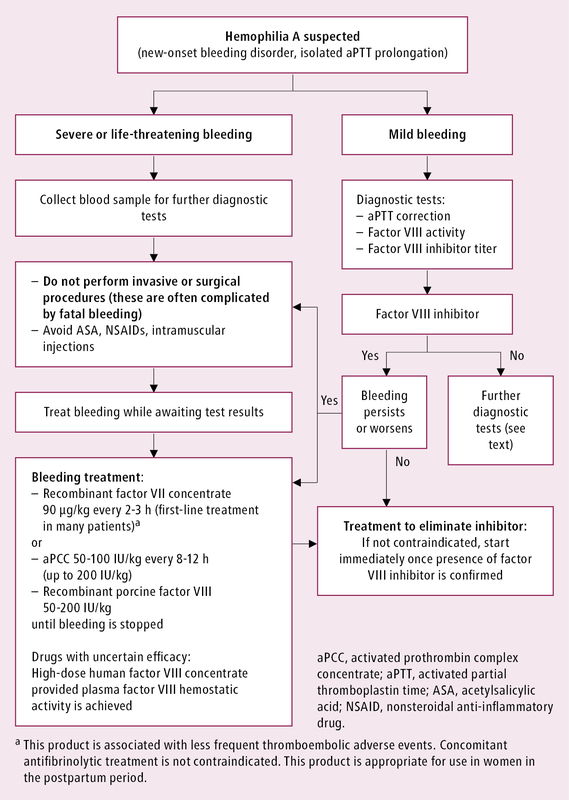 Diagnostic algorithm of acquired hemophilia. Figure 2. Management of a patient with acquired hemophilia A.